The ABI BoardMaster 19" Rack Universal Diagnostic System is a uniquely versatile, self-contained and easy-to-use test system. It offers the most comprehensive set of test instruments for fault-finding on almost any kind of PCB. As the product of choice to companies operating in rail transport, aerospace, military, automotive, telecoms and a range of other industrial sectors, the BoardMaster is ABI's top of the range solution that saves customers time and money, increases asset availability and reliability. With the full range of instruments and a variety of test methods guaranteeing the best possible fault coverage, the BoardMaster 19" Rack provides the ultimate in diagnostic tools. 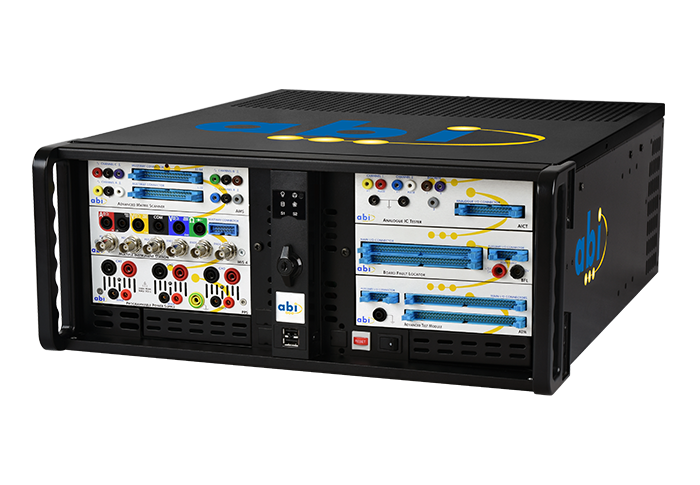 The BoardMaster 19" Rack comes complete with ABI's multi-license and user friendly SYSTEM 8 Ultimate Software preinstalled. Customers are guaranteed to receive FREE software updates for life and will not be charged for additional seats or maintenance fees. The powerful yet easy to use software includes user access management, ABI's exclusive TestFlow Manager as well as a wealth of customisation options. Contact ABI's sales team for more information. Note: the configuration above can be modified to suit special requirements and applications. Please click here for a review of each individual SYSTEM 8 module that can be combined into the BoardMaster 19" Rack. Some existing custom solutions can be viewed here. ABI can supply the BoardMaster 19" Rack with a wide range of accessories for virtually any type of connection / IC package. Contact our sales team for more information.